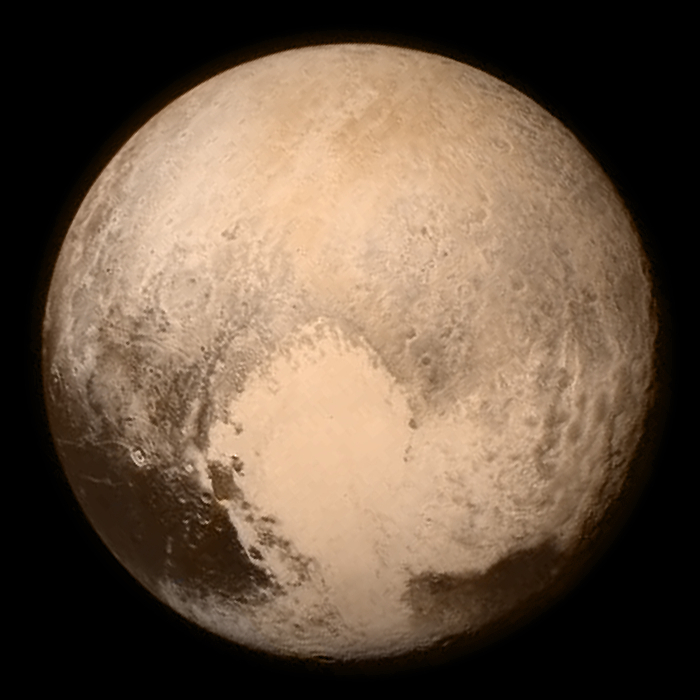 * March 2015 IAU Image Typical of Pluto Expectations: (List of Solar System Formation Problems, just below.) 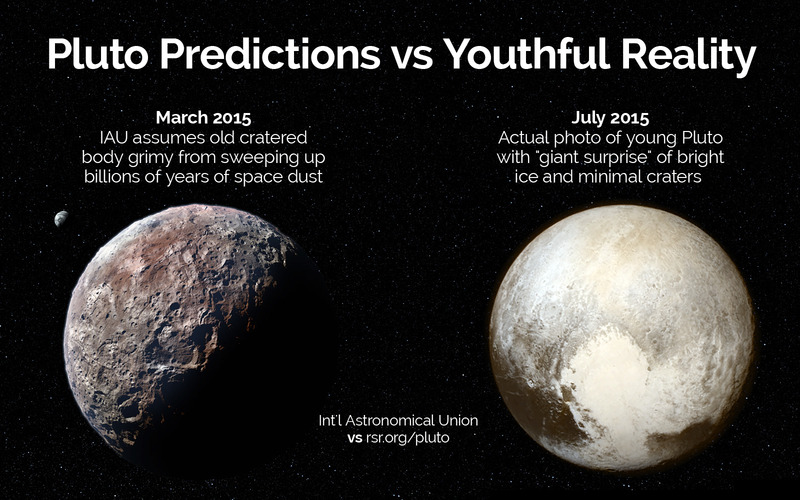 A few months before today's program, the International Astronomical Union used an image of Pluto (right) that represents the expectations of secular astronomers depicting a heavily cratered body grimy from sweeping up billions of years of space dust. This visual prediction failed. Likewise, from its physics to its major predictions, the entire theory of solar system formation, the nebular hypothesis, has failed. Exoplanets, with their masses, sizes, composition and orbital characteristics differ from what had been predicted for decades by the standard model of solar system formation, including with their retrograde orbits, highly inclined orbits and hot jupiters, effectively falsifying that model. * July 2015 What Pluto Actually Looks Like: The actual photos of Pluto from NASA's New Horizons mission will help make it obvious to thousands more people that the nebular hypothesis theory of origins is not helpful in understanding our solar system (or any other solar system for that matter). 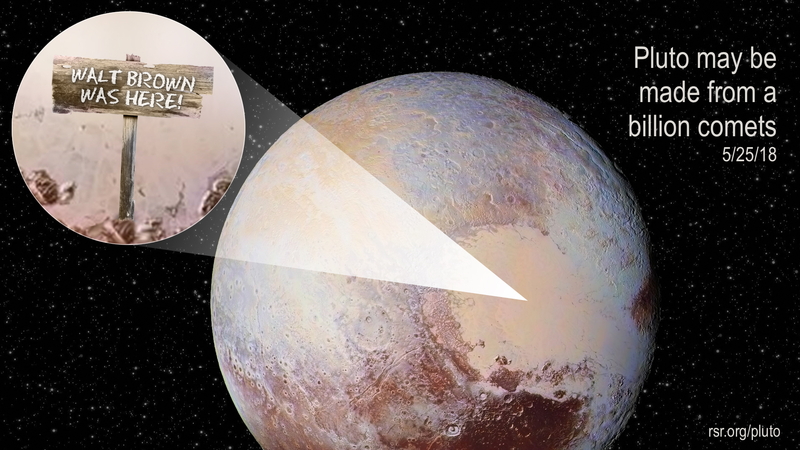 On today's program, Bob and Fred air an audio clip from a leading planetary scientist on the Passport to Pluto Science Channel update on NASA's mission acknowledging that even close to home, the predictions of mainstream (secular) astronomy mostly fail, and that's for planets nearest to home, in our very own solar system system. - small bodies spiral in so quickly, in just a few hundred orbits, that Nature 2014 by anti-science blind faith claims "sub-metre-sized pebbles [grew] into 100-km-sized bodies, possibly in a single leap [??] ... through an unknown process." - the journal Earth and Planetary Science Letters 2004 sums up that "we do not really understand the physics of planetesimal formation, or how the planets came to have their present chemical compositions"
- that Uranus rotates perpendicularly, Pluto rolls, and Venus rotates backwards. * Planet Formation Not Demonstrable by the Laws of Physics: Reports in 1972, 2000, and 2015, concur that the claim that the idea of planets accreting from collisions of dust and small rocks has not been demonstrated by application of the law of physics. 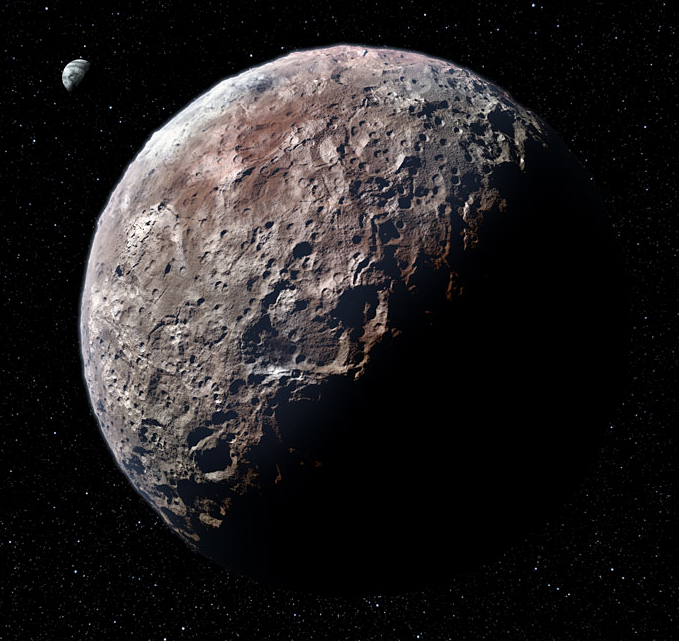 “It turns out to be surprisingly difficult for planetesimals to accrete mass during even the most gentle collisions”, Scientific American, May 2000. “But little is known about how microscopic dust particles can grow 14 orders of magnitude bigger to become a giant planet within the relatively short lifetime of the disk”, the journal Nature, November 2015. And regarding the gas giants, "Talk about a major embarrassment for planetary scientists. There, blazing away in the late evening sky, are Jupiter and Saturn—the gas giants that account for 93% of the solar system’s planetary mass—and no one has a satisfying explanation of how they were made”, Science, November 2002. Notice that mainstream science outlets typically do not acknowledge severe problems with their most popular theories unless they have something, anything, to offer as a possible patch or replacement. If they were more objective, they would readily acknowledge such problems. Also, these science publishers, acting as a public relations service for the atheistic worldview, have adopted a ploy advocated by Eugenie Scott by which they present every new problematic discovery as "shedding new light onto how" such and such a thing originated, rather than forthrightly acknowledging that the latest discovery tends to falsify their theory. [MYTH:] About 4.5 billion years ago, the Solar System formed in a disk of gas and dust particles that surrounded the newly born Sun. The ‘giant’ planets (Jupiter, Saturn, Uranus and Neptune) formed first, within the few million years of the disk’s lifetime. Closer to the Sun, the small, rocky ‘terrestrial’ planets (Mercury, Venus, Earth and Mars) took tens of million years to form, by collisions of numerous smaller objects generated in the disk. Myriad small bodies formed the asteroid belt between the orbits of Mars and Jupiter. [REALITY:] Despite decades of attempts, no computational realization of standard formation theories has reproduced the mass and orbital distribution of both the terrestrial planets and the asteroids. Writing in the Monthly Notices of the Royal Astronomical Society, Izidoro et al. show that this is not possible. Enjoy also RSR's Planet Formation Theory Decimated. - Asteroids, incorrectly called "minor planets", to explain the many peanutroids and their high rotational angular momentum. * Consider the Planetary Catastrophists' Earth/Mars Flood Irony: Secularists deny that Earth could ever have had a global flood, even though our planet's continents are covered nearly a mile deep in sedimentary strata and the Earth is more than two-thirds covered in ocean water that averages 2.5 miles deep! Meanwhile, Mars is a global desert. Yet Nasa speaks of Mars' former Land of Noah (Noachis Terra) and its watery Noachian Epoch; when its fountains of the great deep "burst" forth onto the surface; with its proposed "global-scale", "catastrophic flood" or even "catastrophic floods that"¦ occurred "nearly simultaneously" which "merged into an ocean", "possibly global in extent." In 2015, NASA's Jim Green claimed that, "Two thirds of Mars' northern hemisphere was a huge ocean that may have been as much as a mile deep." So NASA (which is willfully ignorant of the evidence for the fountains of the great deep) thinks that ocean, which disappeared because "Something happened on Mars and it suffered a major climate change and lost its surface water", helps explain why the planet is still moist. - Dark energy does not exist; inflatons do not exist; dark radiation does not exist. Instead, God exists. - Asteroids: that outgas, that have six tails, that look like comets, etc., see phys.org, NASA, EarthSky, etc. * Help Us Reach a Small YouTube Milestone: RSR's newly attended to Bob Enyart YouTube channel is about to hit 75,000 views. Please click to check out a video, and we should hit that goal by Saturday, July 18th! * Get a Great Astronomy Resource: Get RSR's Evidence Against the Big Bang video on Blu-ray, DVD, and as a download! You may also love Spike Psarris DVD What You Aren't Being Told About Astronomy and Vol. II, Our Created Stars and Galaxies! These are hands down the best astronomy videos ever made! You'll agree, or your money back! Also, purchasing them from us here at RSR will help us keep our radio show on the air reaching more and more people! And have you browsed through our Science Department in our KGOV Store? (That's what we call it.) Check out also Bob Enyart’s Age of the Earth Debate against a well-known geophysicist and a University of Colorado mathematician who are members of the Denver chapter of Reasons to Believe. And we ask you to consider getting a Bob Enyart Live monthly subscription, in audio or video, of one of our really fun and educational resources! Finally, please consider helping us reach our vitally important July 2015 Telethon goal of $30,000! We're currently at $11,600, and you can help by clicking on the Store tab above, and then making a one-time or monthly donation, or signing up for a subscription or browsing our Science Department for some great science resources! * Helium-3, Another of the Evolution's Inexplicable Problems: NASA and all those who still promote the discredited nebular hypothesis of solar system formation have more faith in their theory than they do in basic physics. Another of many more problems for evolutionary astronomers is that Earth should not be loaded with helium-3 (relatively speaking), but it is! See more here and here about the problem helium-3 presents to old-earth materialists. * Missing Uniform Distribution of Radioactivity: The materialist theory on the origin of the elements in the periodic table claims that all of our radioactive elements were created in the explosion of stars (no longer supernovas, but now nuetron stars and even black holes), but that would predict a relatively uniform distribution on Earth, at least throughout the crust, and possibly the mantle too. So in today's otherwise contentious interview, Krauss agreed with Enyart's statement that 90% of Earth's radioactivity (uranium, thorium, etc.) is located in the continental crust, and Krauss added, a mystery for him, that it tends to concentrate around granite! That is, that 90% is not in the mantle nor in the enormous amount of the crust which lies under the oceans, but our planet's radioactivity is concentrated in 1/3rd of 1% of the Earth's mass, in the continental crust. (Further, the release of it's heat has not yet reached a steady state.) Krauss offered a partial explanation: that uranium was originally evenly distributed throughout (an alleged) molten earth but being a large atom, it floated toward the surface. This the bias of this physicist led him to forget, apparently, that it is density, and not size, that causes things to float. Even denser than gold, uranium is one of the most dense elements (excluding atheists and other manmade phenomena). Further, for argument's sake, that would only explain the relative absence of radioactivity deep in the Earth, but would not explain uranium's distancing itself from the mantle and from the oceanic crust, nor its affinity for the continents and even, of all things, for granite. Further, under Krauss' belief in the widespread falsehood that the planet was once molten, if so, then the gold in the crust should have sunk to the core! The creationists, on the other hand, have a theory based on observational science as to why radioactivity is concentrated around granite. The isotopes of each chemical element have almost constant ratios with each other. ... Why is the ratio of 235U to 238U in uranium ore deposits so constant almost everywhere on Earth? One very precise study showed that the ratio is 0.0072842, with a standard deviation of only 0.000017. Obviously, the more time that elapses between the formation of the various isotopes (such as 235U and 238U) and the farther they are transported to their current resting places, the more varied those ratios should be. The belief that these isotopes formed in a supernova explosion millions of light-years away and billions of years before the Earth formed and somehow collected in small ore bodies in a fixed ratio is absurd. Powerful explosions would have separated the lighter isotopes from the heavier isotopes. See also Bob Enyart's debate with an acclaimed British author at rsr.org/theistic-evolution, more about this Pepperdine event at rsr.org/trading-genesis, and more fun science facts at rsr.org/young-earth. 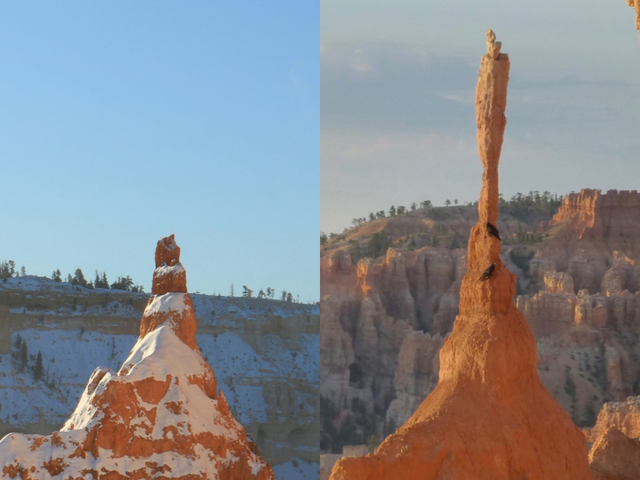 * Earth's Rapidly Collapsing "Ancient" Geologic Features: In 2017, RSR broadcast our own list of rsr.org/earths-collapsing-ancient-features including that Bryce National Park's famous rock spire called the Sentinel has fallen. * See All of Our Great RSR List Shows: We think you'll love them! (Or, if you hate them, they just might change your life.) Check them out at rsr.org/list-shows.